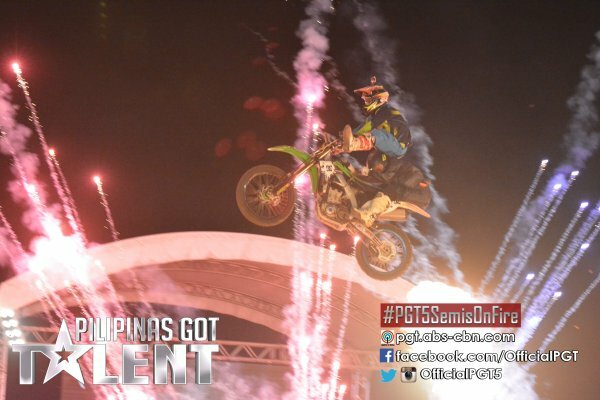 MANILA, Philippines - Motocross performers UA Mindanao impressed judges and viewers on their breathtaking and death-defying semi-finals performance on Pilipinas Got Talent (PGT) on Saturday, April 23, 2016. UA Mindanao from Kidapawan City once again proved they deserved the grand finals slot. "I was impressed on your performance. It was death deying and breathtaking. You deserved to be included in the Finals," judge FMG said. "Grabe kadelikado ng ginagawa nyo. Nakakainis kayo sa galing. Nakakaproud kayo," judge Angel Locsin has commented. "Bihira tayo makakita ng ganyan sa Pilipinas. Walang ibang contest na nagpapakita ng ganyan. Ngayon palang iboto nyo sila. Deserve nila makapasok sa grand finals," Vice Ganda said. To vote via text, key in PGT space UA and send to 2366. Note: One vote per SIM, per contestant is allowed. ABS-CBN mobile subscribers can cast their votes for free while P 1.00 per vote is being charged for other networks. Did you like UA Mindanao's performance? Tell us in the comment section below.